Steel cut oats raise blood sugar less than rolled oats and have a heartier, more satisfying texture, but the downside is they take much longer to cook. Solve this problem by prepping them overnight in your slow cooker — they’ll be ready by morning! 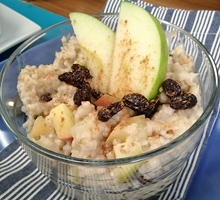 Combine the oats, water, apples, and figs in the slow cooker. Cook on low setting overnight for approximately 8 hours. Optional: chopped nuts, cinnamon, sugar, honey, or maple syrup for serving.